Week zero is a time to familiarize yourself with the diet, the allowable foods, the recipes, where to find ingredients, etc. We suggest you implement Week Zero for at least 7 days prior to starting Phase 1.
Review the cooking and nutrition information. 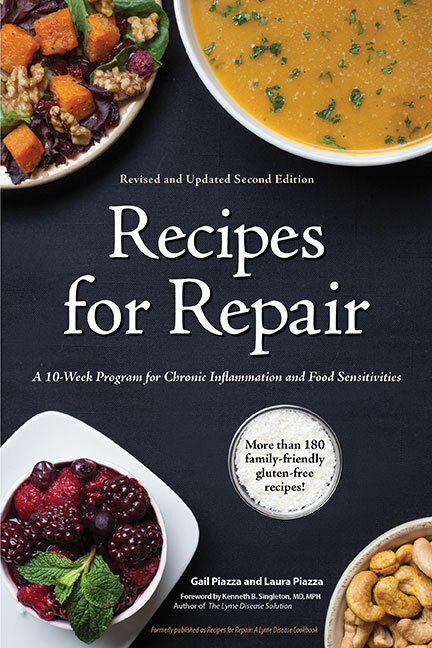 The first thing you should do is to read Part 1: Living the Lyme Inflammation Diet® and Part 2: Getting Started in the book. Here we discuss money-saving tips, general cooking and preparation information, definitions of healthy foods that might not already be part of your diet, and information on kitchen equipment. Learn the diet. Pages 24-39 of the book fully explain the diet. If you don’t have the book, read all the pages under “the diet” tab. Both options will give you a good understanding of Dr. Singleton’s anti-inflammatory diet. Familiarize yourself with the recipes and the allowable foods. Phase 1 in this most restrictive phase of the diet. It only lasts for one week though. Check out page 70-71 of the book to read about Phase 1 and view the allowable foods. Download all of the Allowable Foods by Phase, from the diet toolkit in the sidebar on the right. It is formatted so you can quickly see when your favorite foods come back. Stocking your pantry. This is a very important part of week zero if you’re new to the diet or if this is a big change from how you currently eat. How we eat is dictated by how we shop. As you familiarize yourself with the diet’s allowable foods, also take note on what foods are never allowed. Spend some time reading labels on the foods in your fridge and pantry. If they contain sugar, artificial ingredients, trans-fats and other ingredients that are not condoned on the diet do not restock them next time you are shopping. The goal this week is to start replacing processed, convenient foods with healthier alternatives. Try the recipes. Thumb through the pages of our book or browse our web site and pick some recipes that appeal to you. These are all professionally developed recipes and I can attest to the fact that these recipes are not what you’d expect to eat on a diet. Once you try some recipes and realize they taste really good it will help alleviate some of the fears you may have about starting the diet. Make extra. My mom always says “cook once, eat many times.” If your going to be preparing some of the recipes, why not consider doubling some recipes. This is not much more time or effort, but will give you extra servings that you can freeze. There’s nothing better than coming home after a long day and reheating a meal that’s already been prepared. If you are a parent and concerned that your kids won’t eat any of the meals in Phase 1, cook some meals from the later phases and freeze them. During Phase 1 reheat those meals for the kids while you enjoy your Phase 1 recipes. Make a meal plan. For ease, we have created a meal plan for Phase 1 that is published on our site. This can be used as a starting point or followed the the letter. Page 12 provides a list of all the recipes in the book, divided by Phases including the recipes in the Pantry and Sauces and Condiments sections. It also is cross referenced by allergen (gluten-free, dairy-free, egg-free, low sugar or vegetarian). Decide which recipes you want to make, and plan your menu during this prep stage and start thinking about a meal plan for Phase 1. Preparation is the secret to success, both when cooking and implementing the diet. Upcoming posts will provide you with tips and strategies on how best to prepare so that when you start Phase 1, you will have a minimal amount of work.